Salads are often a foundation for my meals – not just a side dish. I use them as a base for chicken, beef, eggs or whatever protein I happen to be serving. I layer them under a goulash, chili or any casserole thick enough to hold its own. I even layer them on a pizza fresh out of the oven. A perfect way to get my greens which melt into the warm pizza and give it whole new meaning. Greens, (and in this case, red vegetables) especially when raw, are the most natural way to cool the body and deliver the nutrients it craves to do its best work. There are so many great things about this salad: Not only is it extremely healthy, but it is also beautiful, pleasing to the palate (especially when you serve it with a dollop of Crème Fraîche) and so very easy to prepare. The beets, with their natural occurring nitrates, dilate and relax your blood vessels, lowing blood pressure. They are also a detoxifier, and provide anti-cancer nutrients, minerals, and fiber – which few of us get enough of today. Plus, for my workout friends, beets help boost stamina during your workout. I often drink beet juice just for that reason. 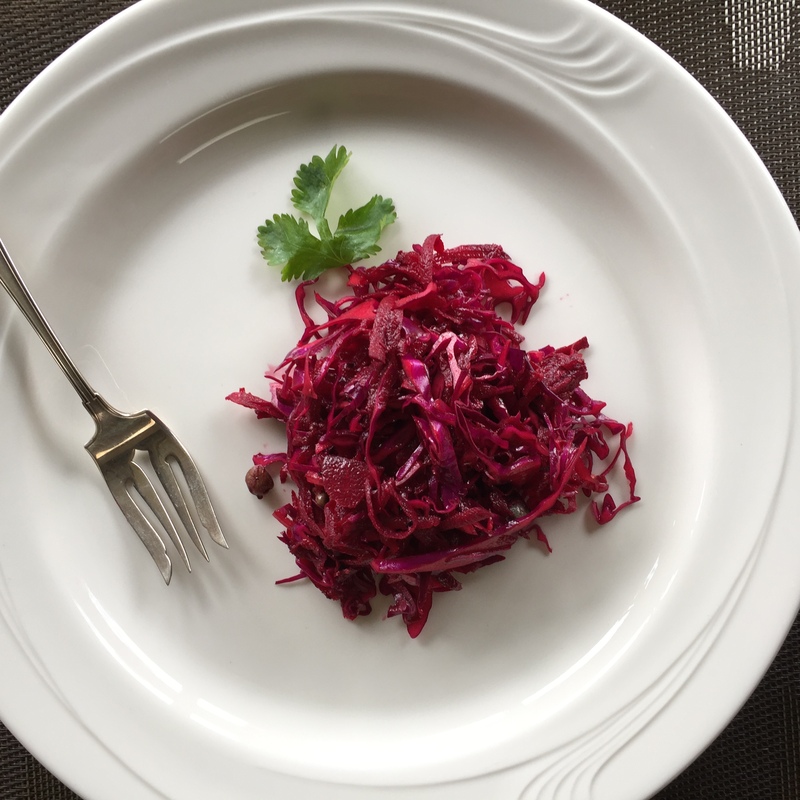 Cabbage and onions top it off with powerful anti inflammatory benefits. Cabbage, loaded with vitamin K, is your brain food. Red onions with their high sulfur content have been shown to lower cholesterol levels. So…. if you’re not a beet eater, this may be reason to wade in and give it a try. The only catch in the recipe is this: beets will turn your fingers pink when you grate them. I generally wear gloves or hold the beet in a paper towel as I grate to avoid this. Mix the beets, cabbage and onion together. Sprinkle on the balsamic vinegar – go easy and taste as you go to get the right amount. Mix in enough olive oil to lightly cover and finish with the lemon juice. Toss in the capers and serve with a dollop on crème fraîche on the side. This is a smooth, rich accompaniment. Not essential but so beautifully pairs with the salad to give it a completely exotic taste and mouth feel. Easy to make, just needs a day to set and thicken. Pour the heavy cream into a glass bowl, Mix in the yogurt (or buttermilk). Whisk, cover and allow to set at room temperature until thickened – from 12 to 24 hours. Place a dollop on the when serving the salad. PS – One final note about capers. Capers are the unripe buds of the Flinders rose, a perennial, native to Hawaii, that are pickled and served in Mediterranean dishes. They have a tangy flavor and are a favorite of mine. I often add to my lemon chicken or fish. I always love hearing from you! Let us know how you like this recipe in comments below!